If you love bears or know someone who adores them, these romantic teddy bears make perfect gifts for valentines or any occasion when you just want to say I Love You. Here's an interesting fact: never underestimate the love and protectiveness that a mother bear feels for her cub. In the wild, even bears who have got to know particular humans and trust them as friends have been seen to become a little dangerous in defence their beloved youngster if the human does as little as get in between a mother and her cub. Scottish Wildlife phtographer, Gordon Buchanan, well known for his enjoyable films which he has made on many occasions for the BBC's popular Springwatch and Autumnwatch series, discovered how strong this loving bond between mother and cub was the hard way. Whilst filming a three year old mother bear called Lily and her cub named Hope for a remarkable three part series called The Bear Family and Me, first shown on BBC television at the start of January 2011, Gordon gained the confidence of Lily so much that she would allow him to sit with her and feed her. At one stage Lily must have thought Gordon was paying a bit too much attention to her cub though and, although not a real attack, gave him a nip on the leg which certainly told him quite clearly that Lily wanted him to back off from her cub a little. Gordon wasn't seriously harmed and the relationship between himself, Lily and Hope continued to grow so much that he was later able to take his wife and children into the forest to see the bears. But it's a lesson to remember - never get between a mother bear and her little one. Our romantic Bear Hugs gift basket is loaded with items carefully selected to make a extremely special impression. the entire basket is attractively arranged and then tastefully decorated with silk flowers ivy and ribbon! Soft, cuddly, and as sweet as can be, the I Love U Plush Teddy Bear is a perfectly romantic gift your special someone will love! A light brown plush bear arrives holding a deep red heart and has a letter embroidered on each foot to collectively spell out, I Love U when seated. 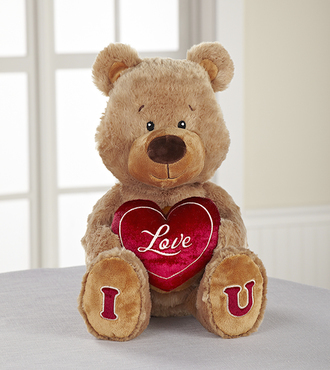 Sending a message of your love and deep affection, this plush bear is a gift from your heart to theirs to let them know how much you are always thinking of them no matter the distance. 12-inch seated plush bear. A darling Teddy bear clutching a big red heart sits on a bed of flowers on this unique metal music box. Hand enameled in coral pink and decorated with small white flowers, the wind-up box is embellished with orange and clear crystals and gleaming gold trim. Revolves to the melody of Beethoven''s ?Fur Elise.? 5 ?'' high. Blancho Bedding is a joint-venture who focused on beddings relative home textiles and home decor products. We offer exceptional quality bedding ensembles and much more. Our wide ranges of appealing colors assure that everyone will find designer bedding sets to match any room. We are constantly designing and creating new and stunning designer bedding collections and ensembles to offer at affordable prices. lovable and soft pajamas made with lightweight flannel fabric. With teddy bears and heart prints all over! Dayspring Cards 72692 Plush-Hug For Your Heart Bear-Love-Pink - 9 in. Size - approximate 8 1/2 H in. Dimension - three and a half x 3 x 5.5 in. Could the bear have a secret friend? Who is leaving him surprises? The ever-adorable Daniel Pinkwater spins a humourous and sweetly offbeat story.One morning, the bear finds something just outside his cave. It is orange and long and pointy and has bushy green leaves at one end. And itâ€™s sweet and crunchy! Where did it come from? Did someone leave it for him? Then there are 2 more of the sweet crunchy things the next morning! The bear knows that someone nice is leaving him these treats. If only he could discover who it is! Should he leave something tasty in return? With the assist of Will Hillenbrandâ€™s endearing illustrations, the inimitable Daniel Pinkwater spins a charismatic little mystery about unexpected kindnesses and finding that extra-special someone. Toys play a crucial part in development of a child. Toys as easy as wooden blocks or numbered puzzle develops cognitive and physical skills. Complex puzzles remote control cars bubble guns helps learn and analyse cause effects and spatial relationships. Babies tend to play more and more with such toys and make themselves happy. Children's attitude towards their toys nurtures them big way. For even more romance, check out our Cherished Teddies Figurines: Love Teddy Bears selection. Home for Collectible Teddy Bears and more great bear stuff. If you like this page, please consider placing a link on your website or blog - Sincere thanks!